Prominent & Leading Authorized Wholesale Dealer from Ahmedabad, we offer leica sprinter 150 digital level, leica sprinter 50 digital level and leica sprinter 250m digital level. 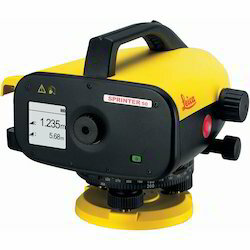 We are reckoned entity of this domain indulged in providing an enhanced quality Leica Sprinter 150 Digital Level. Improve your efficiency with the automatic calculations of the Leica Sprinter 150 for delta height and tracking & monitoring. The digital level covers almost all construction applications such as cut & fill, line levelling and distance measurement. For continuous measurement choose the tracking and averaging mode for even more accurate results. Does your crew speak different languages? The Leica Sprinter is the only instrument of its class with multiple languages on-board. This allows you to choose the preferred language – simply and with only one keystroke, for improved efficiency and convenience. 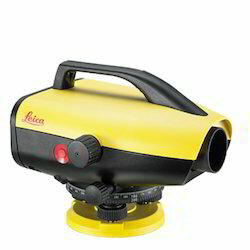 We are engaged in providing a wide range of Leica Sprinter 50 Digital Level to our clients. Improve the quality of your daily measuring tasks. Get the results simply by the push of a button. The one-button level is easy to use also without specific instructions or trainings. Glaring sun shine or rain does not stop the Leica Sprinter 50 as it is dust and jet-water protected (protection class IP 55). The results can be read-out from the highly visible LCD even in unfavourable light conditions. Avoiding expensive measuring errors can save you a lot of money. The build-in tilt sensor of the Leica Sprinter 50 prevents the system from measuring if you operate outside the compensator range. Due to this safety check, you can be sure to get always accurate results. Improve your workflow and increase your productivity with the Leica Sprinter M levels. All measurements are stored in the appropriate order and can be downloaded to a PC for further use in Microsoft Excel. The different calculation options gives you a high level of flexibility. These digital levels facilitate your levelling jobs significantly. Avoid transcription errors and improve your workflow. Store up to 2,000 measurements and download them to your personal computer via USB Interface. The Sprinter DataLoader enables a smooth data transfer to Microsoft Excel. Your measurements can also be transferred to an external data collector via RS232 interface. Calculates the height difference between points. Enter your benchmark, measure your backsight and then your various targets (foresights) for accurate calculations. The delta height is always calculated and clearly displayed. Whether you only have back and foresights or even intermediate sights, choose the line levelling job you need. Enter your starting benchmark, measure your backsights, intermediate sights and foresights until you have reached your final point. All measurements are stored in the appropriate and convenient order. This onboard application indicates the cut and fill results based on a reference level. Enter your required reference level and benchmark. Take the backsight and start measuring. The program displays now the cut and fill results, height differences, compared to your reference level. 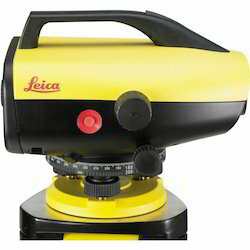 Looking for Leica Digital Level ?